Maybe you thought America’s nuclear arsenal, with its thousands of city-busting, potentially civilization-destroying thermonuclear warheads, was plenty big enough to deter any imaginable adversary from attacking the U.S. with nukes of their own. Well, it turns out you were wrong. The Pentagon has been fretting that the arsenal is insufficiently intimidating. After all -- so the argument goes -- it’s filled with old (possibly unreliable) weapons of such catastrophically destructive power that maybe, just maybe, even President Trump might be reluctant to use them if an enemy employed smaller, less catastrophic nukes on some future battlefield. Accordingly, U.S. war planners and weapons manufacturers have set out to make that arsenal more “usable” in order to give the president additional nuclear “options” on any future battlefield. (If you’re not already feeling a little tingle of anxiety at this point, you should be.) While it’s claimed that this will make such assaults less likely, it’s all too easy to imagine how such new armaments and launch plans could actually increase the risk of an early resort to nuclear weaponry in a moment of conflict, followed by calamitous escalation. That President Trump would be all-in on making the American nuclear arsenal more usable should come as no surprise, given his obvious infatuation with displays of overwhelming military strength. (He was thrilled when, last April, one of his generals ordered, for the first time, the most powerful nonnuclear weapon the U.S. possesses dropped in Afghanistan.) Under existing nuclear doctrine, as imagined by the Obama administration back in 2010, this country was to use nuclear weapons only “in extreme circumstances” to defend the vital interests of the country or of its allies. Prohibited was the possibility of using them as a political instrument to bludgeon weaker countries into line. However, for Donald Trump, a man who has already threatened to unleash on North Korea “fire and fury like the world has never seen,” such an approach is proving far too restrictive. He and his advisers, it seems, want nukes that can be employed at any potential level of great-power conflict or brandished as the apocalyptic equivalent of a giant club to intimidate lesser rivals. Making the U.S. arsenal more usable requires two kinds of changes in nuclear policy: altering existing doctrine to eliminate conceptional restraints on how such weapons may be deployed in wartime and authorizing the development and production of new generations of nuclear munitions capable, among other things, of tactical battlefield strikes. All of this is expected to be incorporated into the administration’s first nuclear posture review (NPR), to be released by the end of this year or early in 2018. Its exact contents won’t be known until then -- and even then, the American public will only gain access to the most limited version of a largely classified document. Still, some of the NPR’s features are already obvious from comments made by the president and his top generals. And one thing is clear: restraints on the use of such weaponry in the face of a possible weapon of mass destruction of any sort, no matter its level of destructiveness, will be eliminated and the planet’s most powerful nuclear arsenal will be made ever more so. A nuclear strategy aimed exclusively at deterring a first strike against this country or its allies hardly requires a mammoth stockpile of weaponry. As a result, such an approach opened the way for potential further reductions in the arsenal’s size and led in 2010 to the signing of the New Start treaty with the Russians, mandating a sharp reduction in nuclear warheads and delivery systems for both countries. Each side was to be limited to 1,550 warheads and some combination of 700 delivery systems, including intercontinental ballistic missiles (ICBMs), submarine-launched ballistic missiles (SLBMs), and heavy bombers. Such an approach, however, never sat well with some in the military establishment and conservative think tanks. Critics of that sort have often pointed to supposed shifts in Russian military doctrine that suggest a greater inclination to employ nuclear weapons in a major war with NATO, if it began to go badly for their side. Such “strategic deterrence” (a phrase which has a different meaning for the Russians than for Western strategists) could result in the use of low-yield “tactical” nuclear munitions against enemy strongpoints, if Russia’s forces in Europe appeared on the verge of defeat. To what degree this doctrine actually governs Russian military thinking no one actually knows. It is nevertheless cited regularly by those in the West who believe that Obama’s nuclear strategy is now dangerously outmoded and invites Moscow to increase its reliance on nuclear weaponry. This sort of thinking now appears to be animating the Trump administration’s approach to nuclear weapons and is reflected in the president’s periodic tweets on the subject. Last December 22nd, for example, he tweeted, “The United States must greatly strengthen and expand its nuclear capability until such time as the world comes to its senses regarding nukes.” Although he didn’t elaborate -- it was Twitter, after all -- his approach clearly reflected both the DSB position and what his advisers were undoubtedly telling him. Of course, we don’t yet know the details of the coming Trumpian NPR. It will, however, certainly throw the Obama approach to the sharks and promote a far more robust role for nuclear weapons, as well as the construction of that more “flexible” arsenal, capable of providing the president with multiple attack options, including low-yield strikes. The Trumpian NPR will certainly promote new nuclear weapons systems that are billed as providing future chief executives with a greater “range” of strike options. In particular, the administration is thought to favor the acquisition of “low-yield tactical nuclear munitions” and yet more delivery systems to go with them, including air- and ground-launched cruise missiles. The argument will predictably be made that munitions of this sort are needed to match Soviet advances in the field. Keep in mind that, under the Obama administration (for all its talk of nuclear abolition), planning and initial design work for a multi-decade, trillion-dollar-plus “modernization” of America’s nuclear arsenal had already been agreed upon. So, in terms of actual weaponry, Donald Trump’s version of the nuclear era was already well underway before he entered the Oval Office. And of course, the United States already possesses several types of nuclear weapons, including the B61 “gravity bomb” and the W80 missile warhead that can be modified -- the term of trade is “dialed down” -- to produce a blast as low as a few kilotons (less powerful, that is, than the bombs that in August 1945 destroyed Hiroshima and Nagasaki). That, however, is proving anything but enough for the proponents of “tailored” nuclear munitions. A typical delivery system for such future nukes likely to receive expedited approval is the long-range standoff weapon (LRSO), an advanced, stealthy air-launched cruise missile intended to be carried by B-2 bombers, their older cousins the B-52s, or the future B-21. As currently envisioned, the LRSO will be capable of carrying either a nuclear or a conventional warhead. In August, the Air Force awarded both Raytheon and Lockheed Martin $900 million for initial design work on prototypes of that delivery system, with one of them likely to be chosen for full-scale development, an undertaking expected to cost many billions of dollars. Critics of the proposed missile, including former Secretary of Defense William Perry, argue that the U.S. already possesses more than enough nuclear firepower to deter enemy attacks without it. In addition, as he points out, if the LRSO were to be launched with a conventional warhead in the early stages of a conflict, an adversary might assume it was under nuclear attack and retaliate accordingly, igniting an escalatory spiral leading to all-out thermonuclear war. Proponents, however, swear that “older” cruise missiles must be replaced in order to give the president more flexibility with such weaponry, a rationale Trump and his advisers are sure to embrace. The release of the next nuclear posture review will undoubtedly ignite a debate over whether the country with a nuclear arsenal large enough to destroy several Earth-sized planets actually needs new nukes, which could, among other dangers, spark a future global arms race. In November, the Congressional Budget Office (CBO) released a report indicating that the likely cost of replacing all three legs of the U.S. nuclear triad (intercontinental ballistic missiles, submarine-launched missiles, and strategic bombers) over a 30-year period will reach a minimum of $1.2 trillion, not including inflation or the usual cost overruns, which are likely to push that figure to $1.7 trillion or beyond. Raising questions about the need for all these new weapons and their phenomenal costs couldn’t be more important. After all, one thing is guaranteed: any decision to procure such weaponry will, in the long term, mean budget cuts elsewhere, whether in health, education, infrastructure, or fighting the opioid epidemic. If, however, the Trump White House embraces a doctrine that closes the distance between nuclear weapons and ordinary ones, transforming them into more usable instruments of coercion and war, it will also make the likelihood of escalation to all-out thermonuclear extermination more imaginable for the first time in decades. There is little question, for instance, that such a stance would encourage other nuclear-armed nations, including Russia, China, India, Israel, Pakistan, and North Korea, to plan for the early use of such weaponry in future conflicts. It might even encourage countries that don’t now have such weaponry to consider producing them. The world imagined by President Obama in which nukes would be a true weapon of last resort was certainly a more reassuring one. His vision represented a radical break from Cold War thinking in which the possibility of a thermonuclear holocaust between the planet’s two superpowers seemed like an ever-present possibility and millions of people responded by engaging in antinuclear protest movements. Without the daily threat of Armageddon, concern over nukes largely evaporated and those protests came to an end. Unfortunately, the weaponry and the companies that built them didn’t. Now, as the seemingly threat-free zone of a post-nuclear era is drawing to a close, the possible use of nuclear weapons -- barely conceivable even in the Cold War era -- is about to be normalized. Or at least that will be the case if, once again, the citizens of this planet don’t take to the streets to protest a future in which cities could lie in smoldering ruins while millions of people die from hunger and radiation sickness. 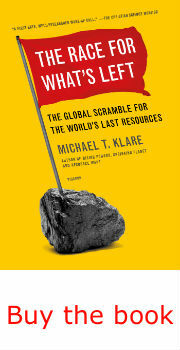 Michael T. Klare, a TomDispatch regular, is a professor of peace and world security studies at Hampshire College and the author of 14 books including, most recently, The Race for What’s Left. He is currently completing work on All Hell Breaking Loose, a book focused on climate change and American national security. Follow TomDispatch on Twitter and join us on Facebook. Check out the newest Dispatch Book, Alfred McCoy's In the Shadows of the American Century: The Rise and Decline of U.S. Global Power, as well as John Dower's The Violent American Century: War and Terror Since World War II, John Feffer's dystopian novel Splinterlands, Nick Turse’s Next Time They’ll Come to Count the Dead, and Tom Engelhardt's Shadow Government: Surveillance, Secret Wars, and a Global Security State in a Single-Superpower World.